Let’s all be super honest! The holidays bring stress. Lots of STRESS!! Even good things create stress and just the sheer volume of extra work brings with it a level of stress. Most of us have schedules that have no extra room to accomplish these extra tasks. Not to mention, the list of things that surface during the holidays. Now I love Christmas but what I really love is family time, relaxing, good food, games and peace. I love celebrating the amazing thing God did by sending Jesus. Accomplishing for us, what we could never do on our own. The last thing I want is to get lost in the chaotic must be perfect American Christmas…but we do…it’s easy. We like pretty things and giving gifts and parties and on and on it goes. If we aren’t careful, we walk through the season and we miss it…or we dread it. Maybe there is hope for the holidays, hope for the stress we are all under. Maybe the solution is to shift our expectations. To expect things to be busy, to expect things to be not perfect, to expect people to be crazy, to expect stores to be busy, to expect kids to argue during advent, and to expect those who’ve experienced grief to be sad. Look at the situation with realistic expectations. Remember what you really value and want out of this time. Take time to sit and take slow deep breathes. Observe the world around you. What do you see? What do you hear? What do you smell? Take time to live in the moment. Know when you need extra support. 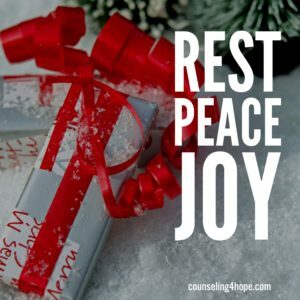 This time of year can be difficult for those who have experienced loss or already struggle with anxiety and depression. Have safe people on call for you, join a support group, or just be real with your family and friends. They love you. You don’t have to pretend. If you need professional help, call a good counselor. The season is about GRACE! Grace God extends to us through the incredible gift of Jesus. Grace wins. Grace doesn’t expect anything but us to be real and messy. Grace gives. Grace forgives. Grace is undeserved. Christmas is Grace. I love Christmas. I love the cooler weather, the warm clothes, warm coffee, and snuggling under blankets with family. I love buying gifts, wrapping gifts, giving gifts, attending Christmas Eve service, being with family, and watching Christmas movies. 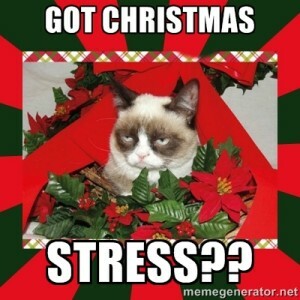 Yet, let’s be honest ladies…Christmas for moms (or women in general) can be STRESSFUL. As if we don’t already have enough to do, let’s pile on a whole bunch of shopping, baking, cooking, decorating, dinner parties, and traveling. Ummmm…. if I added any of that to a regular week then I am overwhelmed but add it all in one month?? Come on now…where did my sanity go? Now, I looove LOOKING at beautiful decorations but honestly, I don’t want to spend that much on decor. I am not even quite sure what to buy when I do have decorating money. So, we continue to use the same decorations year after year. My boys don’t seem to mind and I think it looks decent when I am done. But, I always feel that my decorations are a little, let’s say, less than magazine perfect. I never quite feel like my house has “grown up” decorations (and I’m almost 40). It used to be (back before Facebook, Instagram, Pinterest, etc.) that I would only feel bad when I went to someone else’s home that was beautifully decorated. Now, however, I can feel inadequate just by checking my social media feed. Not only that, there is so much more to feel bad about…my deficient baking skills, I’m not done with my shopping yet, I didn’t get the best deals during Black Friday, my presents won’t have ribbons or bows, my Christmas cards aren’t done, I have no regular daily Christmas activity planned for the kids, and no elf comes to visit in cleverly cute ways. It is honestly comical how we put so much pressure on ourselves during this time of year. I mean what is the point? Who are we pleasing? What are we celebrating??? Comparison is evil! Perfection is unrealistic and unattainable. Life happens in the mess. Mistakes forge memories that bond us together in our humanity. When we share only our achievements and not our mistakes, we don’t connect. We miss each other. We feel alone. 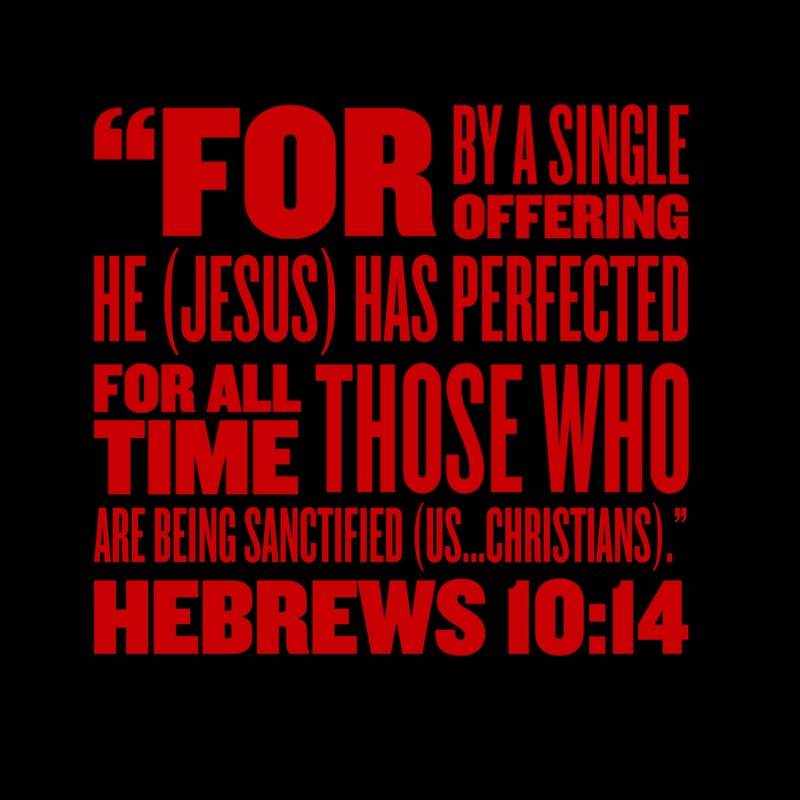 Not only that, if we were perfect…we wouldn’t need Jesus. Isn’t that the whole point of this time of year anyway? Because of our imperfection and brokenness, Jesus was born to be the perfection we constantly strive for. 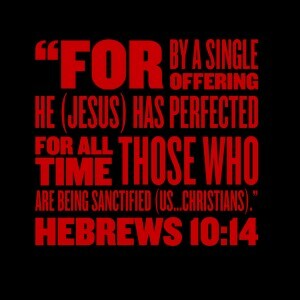 In Jesus, I am completely perfect! So I am free to embrace my human imperfections (of which there are so many…ask my kids and husband). So this Christmas, I am going to enjoy each moment, the great ones and the bad ones. The great ones are a glimpse of eternity when all is made new and the bad ones are a reminder of my need for Jesus! So celebrate the season and do what you want to do. No comparing! Your version of Christmas for your family is just right! 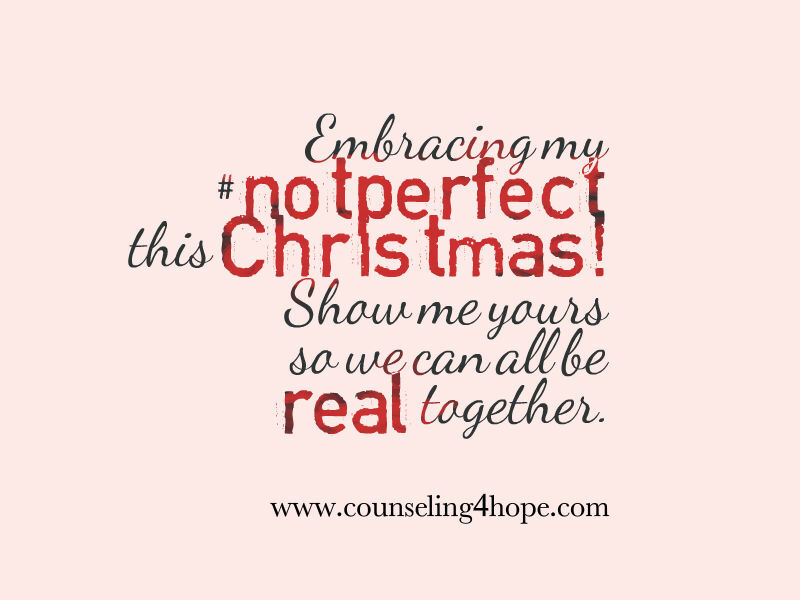 Let’s share our imperfections together this Christmas and have a Not Perfect Christmas. Let’s really connect and be real on social media. Let’s proclaim our imperfections loud so Jesus’ perfection is magnified!